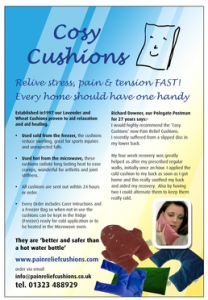 This entry was posted in Customers and tagged Compress, Cushion, Cushions, E-STORE SALE, Ease Pain UK, etsy sale, Frozen Shoulder, Heated Wheat Bags, Microwavable, Oesteo. Arthritis Sciatica Whiplash Tension Headache, Packs, Pads, pain relief, pain relief cushions UK, Physiotherapy equipment, Pillows, Sussex, wheat bags by peterwestern. Bookmark the permalink.